Compound Document is the W3C term for a document that combines multiple formats. The CDF Working Group has defined CDRF 1.0 as a framework to describe such documents. This document specifies WICD Mobile 1.0, a Compound Document profile based on XHTML, CSS, SVG and DOM, which conforms to CDRF 1.0 and WICD Core 1.0. WICD Mobile 1.0 is targeted at mobile agents and is a subset of WICD Full 1.0. WICD stands for Web Integration Compound Document. This is a W3C Candidate Recommendation of WICD Mobile 1.0. This document is based upon the WICD Mobile 1.0 published on 22 November 2006. The current document contains editorial improvements, and minor changes in response to Last Call comments. The disposition of Last Call comments is available (first last call comments, second last call comments). Changes are summarized in I Changes Log to review changes since the last Working Draft. each individual test case in the test suite shall be passed by at least two implementations. It is not required, as a condition to exit CR, that a single implementation passes all CDRF and WICD profile test cases. Once CDRF and WICD reach Recommendation status, however, implementations should aim for 100% compliance. Implementation results will be released publicly. These results are only serving as proof of CDRF and WICD profiles implementability. They are only a snap shot of the actual implementation behaviors at one moment of time and should not be construed as describing the conformance status of implementations at any later date. This document has been produced by the Compound Document Formats Working Group as part of the Rich Web Clients Activity within the W3C Interaction Domain. Publication as a Working Draft does not imply endorsement by the W3C Membership. This is a draft document and may be updated, replaced or obsoleted by other documents at any time. It is inappropriate to cite this document as other than work in progress. Feedback on this specification should be sent to public-cdf@w3.org. This list is archived and acceptance of this archiving policy is requested automatically upon first post. To subscribe to this list send an email to public-cdf-request@w3.org with the word subscribe in the subject line. WICD Mobile is a strict subset of WICD Full. It is therefore possible to create content for WICD Mobile agents and make use of this content in a WICD Full implementation, for instance in a desktop environment. This specification contains information, which is specific to the WICD Mobile 1.0 profile. Any information that applies to all WICD profiles, is compiled into the WICD Core 1.0 specification. Any information that applies to Compound Documents in general, can be found in the Compound Document by Reference Framework and Compound Document by Inclusion Framework specifications. 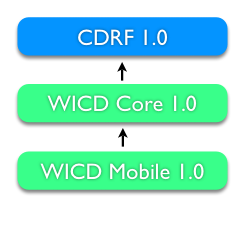 The following image shows the relation between CDR and WICD specifications. Conformant WICD Mobile 1.0 user agents must support XHTML Basic 1.1 [XHTMLBasic11] as the root document. XHTML Basic 1.1 documents should be associated with the application/xhtml+xml mime type. Conformant WICD Mobile 1.0 user agents must support ECMAScript 3rd Edition Compact Profile (ES-CP) as a scripting language. ECMAScript documents must be associated with the "application/ecmascript" Media Type. Conformant WICD Mobile 1.0 user agents must support CSS Mobile Profile 2.0 [CSS Mobile Profile 2.0 Specification]. Conformant WICD Mobile 1.0 user agents must support Scalable Vector Graphics Tiny 1.2 [SVGT12] specification. Future versions of the WICD Mobile profile, which are compatible with WICD Mobile 1.0, must use the same profile string, using the same format, but with a later date. WICD Mobile 1.0 does not require the implementation of the full DOM Level 3 Core and Events. Instead, the following subsets must be implemented. Conformant WICD Mobile 1.0 user agents must support the Document Object Model (DOM) Level 3 Core Specification Subset, defined in the SVG Tiny 1.2 specification for all namespaces. Conformant WICD Mobile 1.0 user agents must support the additional features described in Appendix C Document Object Model (DOM) Level 3 Core Subset Extensions for all namespaces. Conformant WICD Mobile 1.0 user agents must support the Document Object Model (DOM) Level 3 Events Specification Subset, defined in the SVG Tiny 1.2 specification for all namespaces. Conformant WICD Mobile 1.0 user agents must support the additional features described in Appendix D Document Object Model (DOM) Level 3 Events Extensions for all namespaces. Conformant WICD Mobile 1.0 user agents must support the HTML DOM features described in Appendix E Document Object Model (DOM) Level 2 HTML Subset for the nodes in the XHTML namespace. Conformant WICD Mobile 1.0 user agents must support the SVG Micro DOM (uDOM) specification for nodes in the SVG namespace. Conformant WICD Mobile 1.0 user agents must support the ElementTraversal interface on all DOM objects which implement the org.w3c.dom.Element interface. Conformant WICD Mobile 1.0 user agents must support the DocumentView interface on all implementations of the org.w3c.dom.Document interface. Conformant WICD Mobile 1.0 user agents must support the Window Object 1.0 specification on all implementations of the org.w3.dom.AbstractView interface. XHTML event attributes (e.g., onclick and onload) map to equivalent DOM3 Events features. Each event attribute represents the creation and registration of an EventListener. The corresponding element represents the EventTarget. For these event listeners, useCapture is set to false. If the attribute representing the event listener is changed, this corresponds to the removal of the previously registered EventListener and the registration of a new one. The relative order of event listeners due to XHTML event attributes versus other event listeners is not defined. The onkeypress attribute is defined by HTML 4 to declare a handler, whose content is the value of the attribute, and which is triggered when a keydown event followed by a keyup event are dispatched, on the same key and on the same focused element. See: SVG Tiny 1.2 specification for the event mapping. Conformant WICD Mobile 1.0 user agents must support DOM Level 3 event flow (capture and bubble) for all namespaces, including SVG Tiny 1.2. Conformant WICD Mobile 1.0 user agents must support the XMLHttpRequest Object. Conformant WICD Mobile 1.0 user agents, for devices that have a multi directional (2D) joystick input device, must implement a Two Dimensional Focus Navigation with Flattened Children. For guidance see Navigation Models in WICD Core 1.0. In a static situation, focus should go back, all the way, to where it came from, when a user navigates focus in backward direction. Conformant WICD Mobile 1.0 user agents should allow activation of hierarchical child elements using the "Ok" key. Conformant WICD Mobile 1.0 user agents, implemented on devices, that have at least two soft keys and no dedicated escape key, should allow deactivation of hierarchical child elements, using longpress Soft2. Conformant WICD Mobile 1.0 user agents should support Multipart/related packaging. These agents will advertise "multipart/related" capability with their HTTP request accept headers. Internet Media Type implementations must in general treat unrecognized subtypes of "multipart" as being equivalent to Multipart/mixed. Agents supporting a WICD Profile are therefore expected to support both, related and mixed. Implementations preceding this specification may support only Multipart/mixed. These agents advertise "multipart/mixed" with their HTTP request accept headers. The terms used in this document are specified in Compound Document by Reference Framework 1.0. Everything in this specification is normative except for diagrams, examples, notes and sections marked informative. The key words "MUST", "MUST NOT", "REQUIRED", "SHALL", "SHALL NOT", "SHOULD", "SHOULD NOT", "RECOMMENDED", "may", and "OPTIONAL" in this document are to be interpreted as described in RFC 2119 (see http://www.ietf.org/rfc/rfc2119.txt). However, for readability, these words do not appear in all uppercase letters in this specification. At times, this specification recommends good practice for authors and user agents. These recommendations are not normative and conformance with this specification does not depend on their realization. These recommendations contain the expression "This specification recommends ...", or some similar wording. Conformant WICD Mobile 1.0 user agents must implement the "Compound Document by Reference Framework 1.0 (CDR 1.0)" including the extended DOM API's and additional Events. Conformant WICD Mobile 1.0 user agents must implement "WICD Core 1.0". Conformant WICD Mobile 1.0 user agents must support XHTML Basic 1.1 as the root document. Conformant WICD Mobile 1.0 user agents must support CSS Mobile Profile 2.0 as well as the additional specified CSS properties. Conformant WICD Mobile 1.0 user agents must support Scalable Vector Graphics (SVG) Tiny 1.2 specification while referenced from XHTML. When declaring support for WICD Mobile 1.0, a conforming user agent should use an "Accept" header with the value: application/xhtml+xml; profile="http://www.w3.org/2007/wicd-mobile". Conformant WICD Mobile 1.0 user agents must support the Document Object Model (DOM) Level 3 Core Specification subset defined in the SVG Tiny 1.2 specification [http://www.w3.org/TR/SVGMobile12/svgudom.html#dom] for all namespaces. Conformant WICD Mobile 1.0 user agents must support the features described in Appendix C Document Object Model (DOM) Level 3 Core Subset Extensions for all namespaces. Conformant WICD Mobile 1.0 user agents must support the Document Object Model (DOM) Level 3 Events Specification Subset defined in the SVG Tiny 1.2 Specification [http://www.w3.org/TR/SVGMobile12/svgudom.html#events] for all namespaces. Conformant WICD Mobile 1.0 user agents must support the features described in Appendix D Document Object Model (DOM) Level 3 Events Extensions for all namespaces. Conformant WICD Mobile 1.0 user agents must support the mapping from XHTML event attributes to the corresponding DOM3 events. Conformant WICD Mobile 1.0 user agents must support the SVG Event to DOM Event Mapping. Conformant WICD Mobile 1.0 user agents, for devices that have a multi directional (2D) joystick input device, must implement the "Two Dimensional Focus Navigation Model" with support for "Flattened Children". For guidance see Navigation Models in WICD Core 1.0. ECMAScript documents should be associated with the "application/ecmascript" mime type. In conforming WICD 1.0 content, audio referenced from an XHTML object element must have a width and height of zero. The org.w3c.dom.NodeList interface, defined in the DOM Core Level 3 Specification must be supported for the HTMLDocument.getElementsByTagName() method. The SVG Working Group has resolved that the getAttribute and setAttribute methods were missing from the SVG Tiny 1.2 CR specification uDOM DOM Level 3 Core subset by error. Therefore, the next revision of the SVG Tiny 1.2 specification will include the getAttribute and setAttribute methods on the org.w3c.dom.Element interface. Conformant WICD Mobile 1.0 user agents must support the adoptNode method on the Document interface, as defined in the DOM Core Level 3 specification. The CustomEvent type allows applications to use application-domain events. The support for dispatchEvent on EventTarget (in addition to what is supported in the SVG Tiny 1.2 uDOM), provides a way to dispatch the event to the document tree. Finally, support for DocumentEvent provides a way to create CustomEvent instances which can then be dispatched. Conformant WICD Mobile Profile User Agent must support the following subset of the DocumentEvent interface. Note that in a conformant WICD Mobile Profile User Agent, "CustomEvent" is the only required event type. The eventType parameter specifies the name of the DOM Events interface to be supported by the created event object, i.e. "CustomEvent". The CustomEvent init method must be called after creation in order to initialize the Event's values. A user wishing to synthesize some kind of CustomEvent would invoke DocumentEvent.createEvent("CustomEvent"). The CustomEvent.initCustomEventNS method could then be called on the newly created CustomEvent object to set the details of the event to be dispatched. The newly created event object. DOMException NOT_SUPPORTED_ERR: Raised if the implementation does not support the Event interface requested. In WICD Mobile 1.0, only the CustomEvent interface is required. The normative definition of the Document Object Model (DOM) Level 2 HTML is defined here. Extensible Markup Language (XML) 1.0 (Fourth Edition) , C. M. Sperberg-McQueen, Eve Maler, Tim Bray, et al. , Editors. World Wide Web Consortium, 16 August 2006. This version is http://www.w3.org/TR/2006/REC-xml-20060816. The latest version is available at http://www.w3.org/TR/xml. Namespaces in XML 1.0 (Second Edition) , Tim Bray, Dave Hollander, Andrew Layman, and Richard Tobin, Editors. World Wide Web Consortium, 16 Aug 2006. This version is http://www.w3.org/TR/2006/REC-xml-names-20060816. The latest version is available at http://www.w3.org/TR/xml-names. Extensible Markup Language (XML) 1.1 (Second Edition) , Eve Maler, John Cowan, Jean Paoli, et al. , Editors. World Wide Web Consortium, 16 Aug 2006. This version is http://www.w3.org/TR/2006/REC-xml11-20060816. The latest version is available at http://www.w3.org/TR/xml11. Namespaces in XML 1.1 (Second Edition) , Andrew Layman, Dave Hollander, Richard Tobin, and Tim Bray, Editors. World Wide Web Consortium, 16 Aug 2006. This version is http://www.w3.org/TR/2006/REC-xml-names11-20060816. The latest version is available at http://www.w3.org/TR/xml-names11. Document Object Model (DOM) Level 3 Core Specification , Jonathan Robie, Steve Byrne, Philippe Le Hégaret, et. al. , Editors. World Wide Web Consortium, 07 Apr 2004. This version is http://www.w3.org/TR/2004/REC-DOM-Level-3-Core-20040407. The latest version is available at http://www.w3.org/TR/DOM-Level-3-Core/. Document Object Model (DOM) Level 3 Events Specification , Tom Pixley and Philippe Le Hégaret, Editors. World Wide Web Consortium, 13 Apr 2006. This version is http://www.w3.org/TR/2006/WD-DOM-Level-3-Events-20060413. The latest version is available at http://www.w3.org/TR/DOM-Level-3-Events/. Document Object Model (DOM) Level 2 HTML Specification , Johnny Stenback, Philippe Le Hégaret, and Arnaud Le Hors, Editors. World Wide Web Consortium, 09 Jan 2003. This version is http://www.w3.org/TR/2003/REC-DOM-Level-2-HTML-20030107. The latest version is available at http://www.w3.org/TR/DOM-Level-2-HTML/. Cascading Style Sheets, level 2 revision 1 CSS 2.1 Specification , Håkon Wium Lie, Tantek Çelik, Bert Bos, and Ian Hickson, Editors. World Wide Web Consortium, 06 Nov 2006. This version is http://www.w3.org/TR/2006/WD-CSS21-20061106. The latest version is available at http://www.w3.org/TR/CSS21. CSS Mobile Profile 2.0 Specification , Svante Schubert, Editor. Robin Berjon, Previous Editor. World Wide Web Consortium, 08 Dec 2006. This version is http://www.w3.org/TR/2006/WD-css-mobile-20061208. The latest version is available at http://www.w3.org/TR/css-mobile/. Media Queries , Håkon Wium Lie, Tantek Çelik, and Daniel Glazman, Editors. World Wide Web Consortium, 08 Jul 2002. This version is http://www.w3.org/TR/2002/CR-css3-mediaqueries-20020708. The latest version is available at http://www.w3.org/TR/css3-mediaqueries/. XHTML™ 1.1 - Module-based XHTML , Murray Altheim and Shane McCarron, Editors. World Wide Web Consortium, 31 May 2001. This version is http://www.w3.org/TR/2001/REC-xhtml11-20010531. The latest version is available at http://www.w3.org/TR/xhtml11/. XHTML™ Basic 1.1 , Mark Baker, Masayasu Ishikawa, Shinichi Matsui, Peter Stark, Ted Wugofski, Toshihiko Yamakami, Editors, World Wide Web Consortium, 13 July 2007. This version is http://www.w3.org/TR/2007/CR-xhtml-basic-20070713. The latest version is available at http://www.w3.org/TR/xhtml-basic/. XML Events , T. V. Raman, Steven Pemberton, and Shane McCarron, Editors. World Wide Web Consortium, 14 Oct 2003. This version is http://www.w3.org/TR/2003/REC-xml-events-20031014. The latest version is available at http://www.w3.org/TR/xml-events. Scalable Vector Graphics (SVG) Tiny 1.2 Specification Ola Andersson, Robin Berjon, Erik Dahlström, Andrew Emmons, Jon Ferraiolo, Vincent Hardy, Scott Hayman, Dean Jackson, Chris Lilley, Andreas Neumann, Craig Northway, Antoine Quint, Nandini Ramani, Doug Schepers, and Andrew Shellshear, Editors. World Wide Web Consortium, 10 Aug 2006. This version is http://www.w3.org/TR/2006/CR-SVGMobile12-20060810/. The latest version is available at http://www.w3.org/TR/SVGMobile12/. Compound Document by Reference Use Cases and Requirements Version 1.0 , Daniel Appelquist, Timur Mehrvarz, and Antoine Quint, Editors. World Wide Web Consortium, 19 Dec 2005. This version is http://www.w3.org/TR/2005/NOTE-CDRReqs-20051219/. The latest version is available at http://www.w3.org/TR/CDRReqs/. Compound Document by Reference Framework 1.0 , Timur Mehrvarz, Daniel Appelquist, Lasse Pajunen, and Julien Quint, Editors. World Wide Web Consortium, 22 Nov 2006. This version is http://www.w3.org/TR/2006/WD-CDR-20061122/. The latest version is available at http://www.w3.org/TR/CDR/. WICD Core 1.0 , Timur Mehrvarz, Daniel Appelquist, Lasse Pajunen, and Julien Quint, Editors. World Wide Web Consortium, 22 Nov 2006. This version is http://www.w3.org/TR/2006/WD-WICD-20061122/. The latest version is available at http://www.w3.org/TR/WICD/. WICD Full 1.0 , Timur Mehrvarz, Daniel Appelquist, Lasse Pajunen, and Julien Quint, Editors. World Wide Web Consortium, 22 Nov 2006. This version is http://www.w3.org/TR/2006/WD-WICDFull-20061122/. The latest version is available at http://www.w3.org/TR/WICDFull/. OMG IDL Syntax and Semantics , defined in The Common Object Request Broker: Architecture and Specification, version 2, Object Management Group. HTML 4.01 Specification , David Raggett, Arnaud Le Hors, and Ian Jacobs, Editors. World Wide Web Consortium, 24 Dec 1999. This version is http://www.w3.org/TR/1999/REC-html401-19991224. The latest version is available at http://www.w3.org/TR/html401. WebCGM 1.0 Second Release , Lofton Henderson, Roy Platon, Dieter Weidenbrueck, et. al. , Editors. World Wide Web Consortium, 17 Dec 2001. This version is http://www.w3.org/TR/2001/REC-WebCGM-20011217/. The latest version is available at http://www.w3.org/TR/REC-WebCGM. Mobile Web Best Practices 1.0 , Charles McCathieNevile and Jo Rabin, Editors. World Wide Web Consortium, 17 Oct 2005. This version is http://www.w3.org/TR/2005/WD-mobile-bp-20051017/. The latest version is available at http://www.w3.org/TR/mobile-bp/. XHTMLMP+SVGT Combined Markup for Mobile Browsing - Recommended Practice. Vodafone Group. The WICD Mobile specification allows authors to use XHTML, CSS, and SVG together in a predictable way. WICD Core defines basic principles that all comformant content and user agents must apply. Exact language versions and capabilities are defined in the WICD profiles. Content authors are encouraged to see the profiles for guaranteeing use of right feature set. In addition to this specification, the Mobile Web Best Practices 1.0 document provides useful guidelines for delivering content to Web-enabled mobile devices. WICD Mobile is a superset of the capabilities articulated in the default delivery context section of this document. Kurt Cagle, Mercurial Communications Inc.
Vincent Hardy (Previous Working Group Chair), Sun Microsystems, Inc.
Nandini Ramani, Sun Microsystems, Inc.
Svante Schubert, Sun Microsystems, Inc.
Daniel Zucker, ACCESS Co., Ltd.